What’s happening to Asian exports? The hard data on Korea’s export performance in September will be hitting the newswires early on Monday morning, and that will be worth watching as a leading indicator for the rest of Asian exports. The base effect is kicking in. Korean export growth peaked at 35% year-on-year in September 2017. But apart from the high base effect, our estimate of over 5% YoY export decline this September reflects a slack towards the end of the month due to the mid-Autumn festival holiday. But a 22% YoY surge in exports in the first 20 days of the month, partly on the back of front-loading of shipment is still a strong performance, that reinforces no big hit to regional exports from the trade war yet. The recent signing of the US-Korea Free Trade Agreement bodes well for the export outlook. Of several September inflation releases, Philippines’ data will be the highlight. The supply disruptions due to the worst typhoon in recent years will have undoubtedly bumped up inflation higher from August’s 6.4% rate. Our forecast for September is 6.9%, and we feel it is now close to peaking. The Philippines central bank (BSP) raised the policy rate by another 50bp to 4.50% this week, taking the cumulative hike since May to 150bp. However, this still leaves a negative real interest rate as a pull on the currency. We don’t think the BSP tightening cycle is over just yet and the Bank is likely to remain vigilant of the impact of a weak peso on inflation in the future. We expect one more 25bp rate hike before the end of the year. 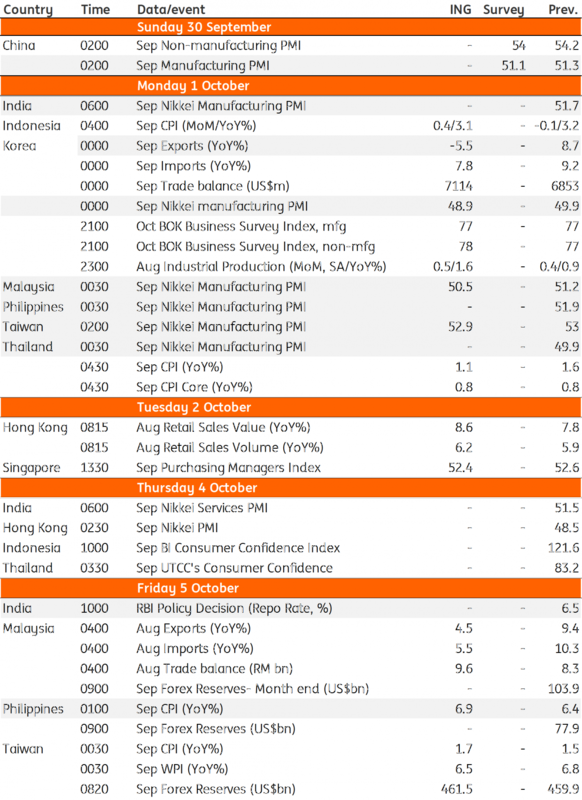 Indonesia, Taiwan, and Thailand are other countries to report September inflation, but we expect nothing exciting here. The Reserve Bank of India unveils its monetary policy decision next Friday (5 October). Speculation is rife about the RBI joining ranks with its Indonesian and Philippines counterparts in aggressive tightening to curb currency weakness, but we're far from convinced. Although the RBI needs more tightening, it’s likely to argue that inflation, the main policy target, has been well-behaved, currently under the 4% (+/-2%) medium-term target. Not only inflation, but ongoing troubles in India’s financial sector from a serial default by a non-bank finance company on its debt obligations and resultant liquidity squeeze are other limitations on the RBI in going for more than the conventional 25bp hike. Also, the government has started taking measures to rein in the rupee's weakness - which although have so far proved to be inadequate, reduce the onus on the RBI to support the currency. We still can't underestimate the potential inflationary impact of ongoing currency depreciation, which will further be complicated by the impact of higher oil prices due to the supply disruption from Iran sanctions. If not in the next couple of months, we expect inflation to rear its head again, thus keeping the RBI busy going forward. We continue to forecast one more 25bp RBI rate hike this year in the December meeting, and two hikes in 2019.